Batman is my hero. He is a fictional hero; he was created by the artist Bob Kane and the writer Bill Finger. He made his first appearance in DC comics issue number 27 on May 1939. Since his first showing he has been in many comics but mainly in one made by DC. Batman goes by many nicknames. Some of them are: The Batman, the Bat-man, the caped Crusader, The Dark Knight, The bat, and many more. His true identity is Bruce Wayne, a billionaire who took over his father's company when his parents were shot by a homeless man. The company is called Wayne industries and it is the biggest company in Gotham city, where Wayne lives. He is billionaire by day and hero by night. Batman is a hero to me because I have learned many good things from him. He has showed me that it is better to care for everybody than just the people who are close to you. He has also taught me that you don't need powers to be a hero, and that even if you have a lot of money you should still go out of your way to help people who aren't as fortunate as you. He has also taught me some pretty sweet fighting moves. He is also my hero because he has always been my favorite super hero and I have always looked up to him. Batman was my favorite cartoon when I was a kid and The Dark Knight is my favorite movie. He is my hero because he stands for everything that is good in the world. Batman is important to me because he has made me a better person. If I didn't watch Batman I would not be as caring for other people as I am now. I would lose my cool more often but I don't because Batman always stays calm and thinks through situations. An example is when I'm playing basketball, instead of just running up the court and shooting the ball, I think the whole situation through and try to find the best option. I never let other people get in my head, just like how Batman never lets the Joker get into his head. I don't let other people get in my head because I know that if they do it will only make me play worse. I have learned that all from Batman. He has inspired me to do good in the world and has taught me that I can do anything if I really work hard at it. I aspire to be like the Batman because I want to help people; I want to bring out the good in everybody, just like the Batman does. I aspire to be like Batman because he plays by his own rules, but stays true to his morals. I aspire to be like Batman because he is my hero. Nelson Mandela is my hero. His story has come to symbolize the struggle against the apartheid machine in South Africa. Apartheid, the terrible, and often violent, institutionalized racism that for so long held South African society in its grip, was not an easy policy to fight against--especially since he was oppressed within the system. Mandela understands what it means to fight against enormous odds; he went to prison for nearly three decades for his work, because he knew there was no alternative. He believes that every human being is of equal value. More than anyone in the world, Mandela embodies the hopes and dreams of a true, lasting justice and equality, not just for South Africans but for all people. 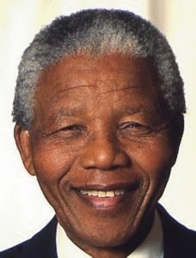 It is Mandela—through his unselfish and constant presence on the international stage raising awareness about AIDS, peace, debt relief, the environment--who most inspires us to think responsibly of our fellow man and of our planet. Nelson Mandela has always inspired me to think beyond myself, to think of people in the wider world as part of a common humanity. I am blessed by his friendship. I love him for what he has accomplished, for what he has been through, for his journey forward. He remains a hallmark of what it really means to give of oneself selflessly--which is, indeed, a gift for us all.